Lady Rabia, our first featured guest and cover model for CAPTIVATING! was born with poor eyesight which was her norm. But can you imagine what it must have been like to suddenly not be able to see when driving? For 25 years she managed quite well with her poor vision. Yet it wasn’t until this scary driving incident that she found out she had the progressive eye disease Keratoconus. As a talented illustrator and author of a children’s book series Lady Rabia has an interesting story of grit and determination. Today she is working to rebuild her publishing company while serving as an Ambassador for Fight for Sight UK. To read her story you can find it in CAPTIVATING! 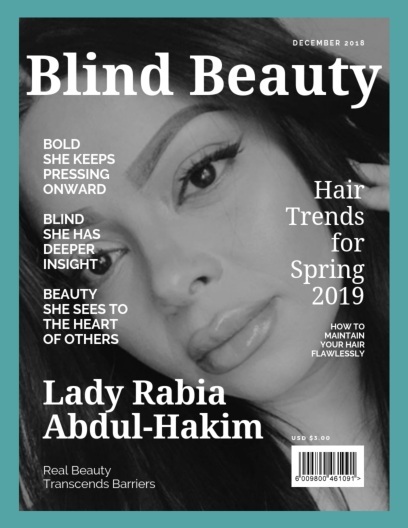 Featured image is a faux fashion magazine cover titled Blind Beauty. A close-up photo of Lady Rabia is on the cover in black & white. She has long straight black hair, natural makeup, and her eyeliner is drawn with liquid liner wispy cat tail technique. Her eyebrows are on fleek and looking great! In this photo of her head is tilted to her right and her left hand is brushing through her hair. While you can’t see the color in this photo, her nails and lipstick color are a matching pink.